Often all sorts of games about farms are good time-killers. I would rank such games also as casual because the rules are clear even for children: take and grow, care for animals, sell goods and you will be happy! I’ve flipped through Google Play on this subject and today I want to talk about the three relatives of Farm. This game was released in 2015. For regulars made a system of daily rewards. Paid content is present, there are always some promotions. The graphics are nice, somewhat cartoonish. The main building – the farm – can show how many objects were built, how many orders were completed. In general, here you can learn quite a lot. Some settings change here. For example, player name, password, account change, privacy settings and music scores with sounds. A farm cannot be moved, while other objects can be rearranged to an arbitrary (free) space. The interface is simple: from above (from left to right) there is a strip of experience, an indicator of money and diamonds. The latter is needed to purchase especially valuable items (donated currency). In addition, with the help of diamonds, it is possible to complete delivery of items ahead of time, for which we receive gold coins. Everything is as usual: Donat gives preferences. New beds can be planted when a certain level is reached. But the number of crops that can be grown just rolls over. Wheat is available first. Then the arsenal is replenished with carrots, potatoes, garlic. There are even special money trees that participate in promotions. The more a player grows them before the onset of the hour X, the more reward he will receive for the work done. By the way, all this joy is placed in the storage for products. Of course, the more buildings and beds we have, the greater capacity must have a store. And here the player has two ways: either use the tools to expand capacity or sell downloaded products and grown crops. I combined these two methods when there were not enough improvement tools. Well, where to get these same tools? They periodically spawn next to the built scenery. Shops, bushes, flowers – all this will bring, if not strange, tools. To infinity, they too cannot be collected: they are stored in a barn. Accordingly, when it is full, you will have to either improve the shed or exchange tools for the experience. If there is no opportunity to expand the barn, I still do not advise you to exchange screwdrivers, because it is more difficult to save them. But the nails can be. In addition to gardens (arable land), there are not only buildings but also various garden trees. For example, on which grow pears and apples. Why? At least some variety! At higher levels (above the tenth) animal pens are opened. Accordingly, we have to keep animals. And for them, even a separate category in the construction menu is highlighted. And before that time we will manage in the bakery, in the kitchen and other objects. Experience is charged for harvesting, and additional points can be obtained by bartering products for them. But how to get the money that we need so much to improve buildings and build new facilities? And for this, you have to fulfill the wishes of the characters coming to the farm. And we will receive the award not only in gold coins but even in diamonds. Another good source of income is the execution of food contracts. We pack everything in bags, ship it to the car, ship it and wait for the return. Yes, this project is not as young as the previous one. 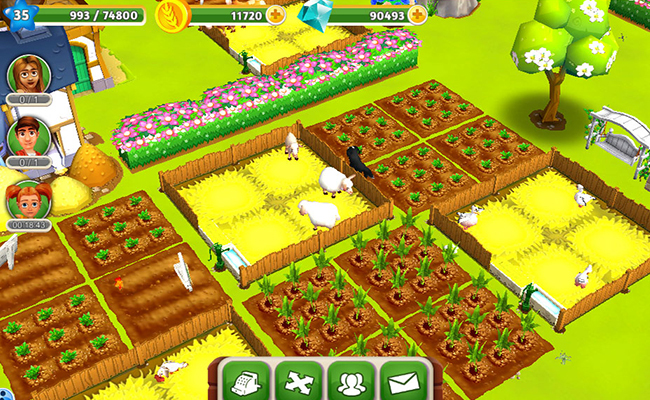 The game “Green Farm 3” was released in 2013. But we all know that applications and games by developers with a capital “P” are developing, overgrowing with new features and subtleties, which allows you to keep the project afloat for several days, gaining and gaining a game audience. The same thing happens with Green Farm 3. In my opinion, this is a rather interesting game. I had “farms” for testing, in which the gameplay was like a turn-based strategy. Immediately everything goes smoothly, which I like. Since I have already touched on this topic, I will reveal another small secret that automatically improved my attitude towards “Green Farm 3”. To plant, say, wheat, in a variety of games you need to have at least one of its grain. In our game, this does not need to be done. This is more convenient because the sale does not need to do the calculations and leave the culture for the stock. Placing the primary buildings in the order it was more convenient for me (I recommend in the ruler in descending order of height), I decided to familiarize myself with what and how to do. In general, here we can not get away from feeding small and large, horned and non-horned livestock. Want to get milk? We’ll have to prepare food for cows from wheat! Food for chicken, which gives (only!) One egg, is more complicated: not only wheat but also tomatoes are required. Some of my honors will be given to the market in the game “Green Farm 3”. This, of course, is good when all the ingredients are in abundance. When the barn is bursting with food, that’s cool. But such machine actions (harvesting and selling it) turn the game from pleasure into work. Accordingly, the game gets bored very quickly and “flies” away from the user’s smartphone. To this did not happen, the developers have provided tasks that are performed using the same market. For collecting the right products and sending them we get gold and experience points. I didn’t like the fact that the window closes after every sale on the market. Well, if you need to sell a couple of goods. And if ten pieces? Not very thought out in this regard. 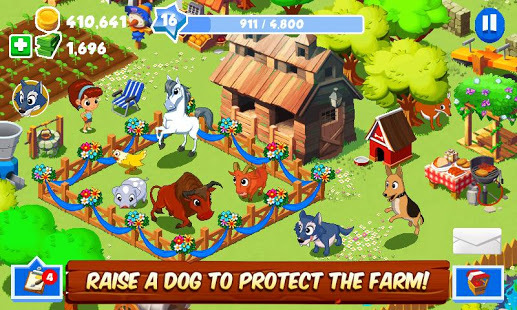 In the game “Green Farm 3” there are several plots of land, each of which can be unlocked after performing certain tasks and, of course, for a certain amount of gold coins. And in order not to be bored, we will help the bots in the game and receive additional gift resources for it. I was a little surprised that the animals would have to be looked after not only in terms of feeding. As it turned out, the cows are very fond of when they are washed. In general, the game provides an excellent opportunity to equip your summer cottage in the way that the user himself wants. Of course, you have to use paths and walls that are not free. With their help, you can organize a pen for animals, because they love to move around the site. 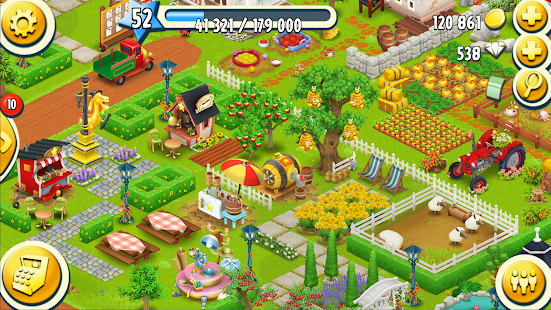 I think that the game “Green Farm 3” is designed for users who want to find a full-fledged, but an intuitive simulator. Why? If the game is about the farm, then this word must necessarily be in its name? By no means! And in general, is it important? I do not think! But the graphics and drawing, the presence of good and understandable learning – this is important. Advertising in the application is missing, which can not but rejoice. But the impression is spoiled a little by the fact that without donat it is much more difficult to build everything. It just takes more time. If in “Green Farm 3” we could grow crops without having a single piece of them, here we will have to forget about it. Harvested in double size from planting. That is, having planted one grain, we will reap two. But here the sequence of construction is thought out coolly, with which it is impossible to argue, as I believe. First, there are crops on which we can grow wheat, corn, and soybeans. Then – chicken coop, bakery, and barn. Well, and then – the building for the production of food. Everything is logical here, the complication goes gradually. And at this time, the player will know the farm life, cultivating various cultures, supporting animals in proper condition and helping their neighbors. Of course, while trading in resources that are at our disposal. It is very important to plant the beds here. Nobody forbids all fields to take, say, wheat. But what will come of it if we need wheat to make food? This is extra time. To the seventh level to gain experience, to be honest, a little difficult. And gold too. But everything changes at this moment because from the seventh level the market is accessible to us. We can simply sell an unnecessary surplus of one or another product. Isn’t that cool? After all, if orders do not go, then this is an excellent solution to the problem. But from the mailbox, you can find out which player is selling what goods at this time. Well, buy them if necessary. Upon reaching the 7th level, we gain access to achievements. For their implementation, we will give a corresponding pleasant reward. I was saddened by the small capacity of the drop tower and the barn. And the first time you will have to either endure it or donate to get diamonds, which will then be spent on the purchase of missing tools. You will have to visit the market often and put your goods on sale, but what to do? Overall, I want to give Hay Day a “4” rating. I was pleased that there is a detailed training, the buildings are built in a logical sequence. The graphics are good, objects are drawn, effects are all at a decent level. There are opportunities for additional earning experience and money. Can’t complete the task or order? It does not matter, we collect products and sell on the market. Of the minuses – the small capacity of the barn and the tower. It is often necessary to “clean up” the whole thing. The choice was very difficult. I downloaded more than a dozen games from Google Play and tested each of them, after which I selected the best ones. If you enter the game only in the morning, afternoon and evening, I can advise Family Farm. However, it will not fit the game all day, because even the simplest crops are grown there for more than ten minutes. You can also play all these games on your PC if you follow these simple steps.